Well known manufacturers of industrial Solid tyres - "Mega-t Unisoft/Sirius". Export: <?xml:namespace prefix = st1 ns = "urn:schemas-microsoft-com:office:smarttags" />Worldwide. Design: Super elastic, pneumatic shaped, recognized as high quality tyres. Users: Forklift trucks, internal port container trailers, mining and special heavy equipment. The Mega-T plant employs the latest technology and equipment. Compression presses from 600 to 1,000 ton capacity. including computerized examination to ensure zero defects. 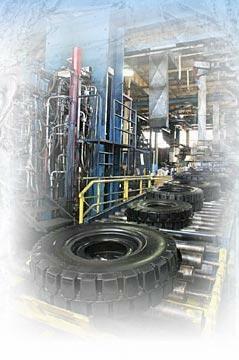 Mega-T Super Elastic tyres are leaders in quality Worldwide.